A few years ago, when working as a District Manager, I had a meeting with about two dozen of my managers to discuss and challenges and best practices they were facing at their facilities. One of my managers told a story about a 17-year-old Food Service Worker that he recently hired. He explained the attendance policy and each time he missed work he presented him the “write-up” and explained to him the next steps until he reached the point of termination. When the manager presented the final termination, the 17- year- old said he understood and then asked when he was scheduled to work next. The manager, who was in his mid-50s, was floored. It was very clear the 17- year- old did not understand there would be a consequence to his behavior. This story lead to a discussion and then into a (somewhat heated) debate about the “new generation” and why they “just don’t get it” and the lack of “work ethic.” I quickly realized we had a “generational problem.” The managers in the room ranged from 25 to 65 years old and the employees they managed ranged from 16 to 70+. I quickly identified this to be my next topic of training. In doing my research, I found a number of books and YouTube videos on the subject. I tried to keep the topics as it related to the service industry workplace. It is importance to educate managers so they better understand the different social norms based on age. Through this understanding, they will be better equipped to maximize productivity. Older employees are loyal to their employer. They take pride in the connection they have and the length of time they worked for an employer. Younger workers are loyal to their skills. They will look for other opportunities if they do not feel there is an improvement in their skill set. By cross training managers in different departments not only gives flexibility, but will keep the younger managers motivated. Millennials grew up in a much more structured environment. (When was the last time you saw a group of teenagers organizing a baseball game on their own). As a result, instructions need to be laid out more clearly and they will often not speak up in the workplace when more information is needed. They will assume they have all the information. Millennials need to know and understand how they fit into the “big picture.” An Environmental Services Worker will need to understand how their roll impacts the safety and wellbeing of the patient. While older employees view advancement in the traditional sense (“you need to put in your time”), Millennials value results over tenure. They will get impatient if they do not move up quickly in the organization and look for other opportunities. It is important to celebrate their successes. 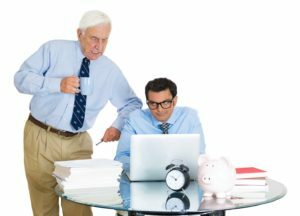 Understanding the generational differences and taking advantage of the strengths each generation has to offer will allow for a more productive workplace. Poor relationships between older employees and Millennials prevent necessary sharing and exchange needed. Mutually respectful relationships, which start with an understanding of one another’s values and differing strengths, are critical. Now back to the story I started with: Who “didn’t get it?” Was it the 50+ year-old manager or the 17-year-old employee. Did the manager clearly explain the consequences of not showing up to work? Did he explain the impact this would have on the rest of the employees in the department? The impact to the patients? We cannot expect Millennials to understand the norms of a workplace when they begin work. They have to be educated, just like the 50+ year-old manager. Michael Salzer has over 30 years of healthcare experience specializing in food, environmental services and facilities management. His background as a financial analyst and in contract and operation management gives him a solid background in finding and achieving significant savings within his projects. His system based approach maintains effective results over time.